Besides our passion for creating beautiful dental prosthetics we have a few unusual hobbies. We've built four experimental homebuilt airplanes. Tom has been a pilot for over 30 years and we love the excitement of flying these high performance airplanes that reach speeds of 200 mph. 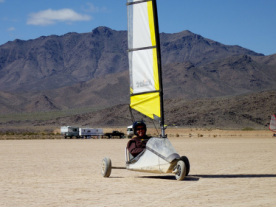 Landsailing at Red Lake Arizona is relaxing and fun. We camp in our motorhome on the dry lake. We love to camp! 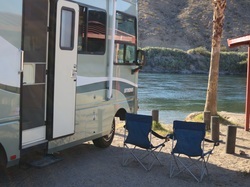 We have a Safari Trek motorhome that we take to places like Davis Camp and the Grand Canyon. 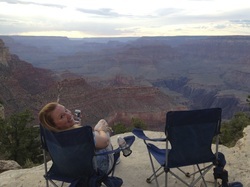 Karen at the rim of the Grand Canyon. 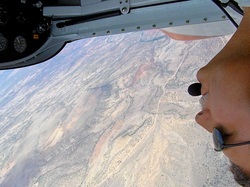 Here's a photo I snapped of Tom upside down in our airplane. 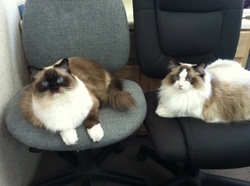 The real owners, Chloe and Cassey... if you have cats you know what I mean!